The Commonwealth Court decision should surprise no one, though Duncan held out hope to his increasingly anxious parishes that the court would be sympathetic. 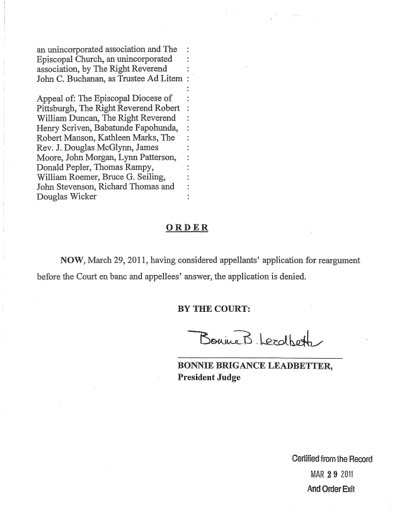 (See “More on the Petition for a Rehearing.”) The body of the court order denying the petition consists of a single sentence: “NOW, March 29, 2011, having considered appellants’ application for reargument before the Court en banc [i.e., before the full court] and appellees’ answer, the application is denied.” I find it amusing that the title of the litigation takes up approximately a page and a half, whereas the body of the order consumes only about a third of a page (see images of the two-page document below). Perhaps Robert Duncan will understand the one-sentence ruling. 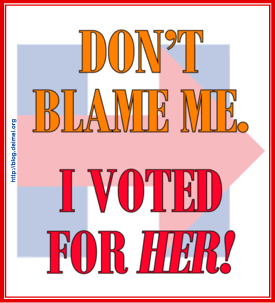 I don´t know, those UNDER NO CIRCUMSTANCES and NO MEANS NO decisions keep piling up and seem to be over his head. My question all along is why keep clutching property and goods endlessly after being told, and retold, they are NOT YOURS for the squatting? 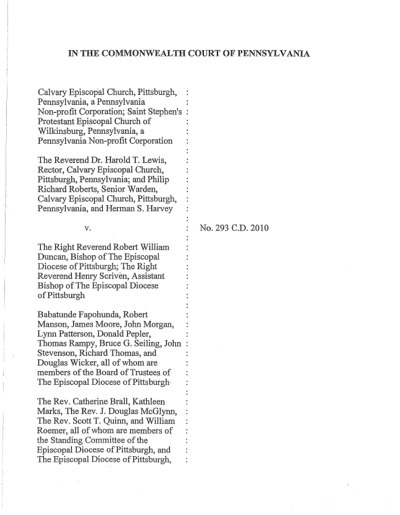 From the start I thought +Duncan and his better-than-others accomplices wanted a ¨place¨ of their own ¨to stand¨--why don´t they go find one and stop elbowing others out of Episcopal Church buldings? This obsessive grabbing and thieving really ought end...NOW.